Digital marketing has become a must-have for businesses that want to stay relevant and competitive in the digital marketplace. For those who are new to the world of digital, it may be hard to navigate all the different types of digital marketing tactics and channels that you can use to grow your business. Not to mention, most small businesses are working with limited budgets and just can’t afford to put a significant amount of money into several different types of digital marketing. That’s why it’s important for small businesses to be strategic about whichtypes of digital marketing channels they use to attract, engage, and convert their customers. Content marketing is one of the most important types of digital marketing because content fuels nearly every other type of digital campaign that your company will implement. From email marketing to social media management, you’ll need great content to run effective campaigns. So what is content marketing? Content marketing is the process of creating and sharing content that isn’t just intended to be promotional. The content that you create as part of your content marketing campaigns is used to stimulate interest in your brand offering while also providing some value for your site visitors. There can be many different purposes behind the content you create. It can be used to inspire, educate, persuade, or even just entertain. Content marketing doesn’t just apply to written content like blog posts, website pages, and e-books. Content can also consist of videos, social media posts, and even webinars. The types of content you create will depend on your campaign goals and your target audience. Consumers want to see more custom content from brands like yours. There are many benefits of content marketing for your small business. Perhaps one of the most important is the return on investment that this tactic provides. Content marketing is not only affordable, but it can have a significant impact on your lead generation, nurturing and conversion campaigns. Though content marketing efforts cost 62% less than traditional outbound marketing tactics, they tend to generate more than 3 times as many leads, according to DemandMetric. One reason for this is that great content helps your business improve SEO. The more indexable pages of content that you have on your site, the more opportunities you have to reach and engage leads on the search engines. Ultimately, this drives more traffic to your site. In addition to helping you generate more leads, content marketing can also boost conversions. In fact, according to ABGEssentials, content marketing helps businesses experience conversion rates that are 6 times higher than other marketing tactics. Content helps you build authentic connections with your customers and leads. By providing informative and valuable content for your prospective customers, you’re helping them make a smarter purchasing decision. As we mentioned before, there are many different types of content that you can create to attract, engage, and convert your site visitors just like there are many different types of digital marketing. The key is to have a strategy driving every piece of content you create. This strategy should take into account both your campaign goals and the audience you are trying to reach. One way to leverage the power of content marketing is to create a blog. Small businesses that consistently blog tend to get much more lead growth than those without. In fact, it can be as high as 126% more (ImpactBnd). On your blog, you should cover the types of content that your target audience is most interested in. In addition to blogging, you can also create more long-form written content like e-books and whitepapers. These types of assets allow you to go into more depth about the topics that your audience finds most valuable. If you “gate” this content, or require readers to provide their contact information before accessing, your business can work to build your contact list and learn more about your leads in the process. More and more small businesses have discovered the power of content marketing and how it can help grow their business. To learn more about content marketing and how it can help your business, check out our Content Marketing Services page. 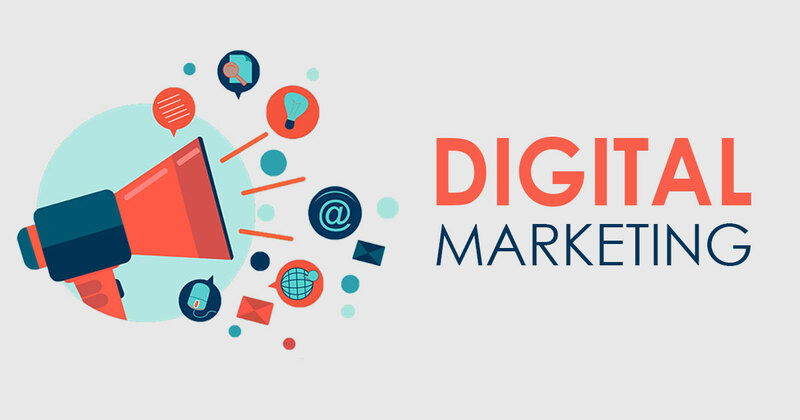 In today’s digital marketplace, a company’s website can be considered one of the most important channels in regards to types of digital marketing. When visitors reach your site, they start to develop an impression of your brand. Your site will also tell them what they need to know about the products or services you provide and what value you can offer consumers. Website design involves a number of different factors. The layout of the site helps determine what pages will be included and how visitors will navigate to them. While the written content frames how visitors see and understand your business. The visuals included on your site, such as logos, colors, images, and other branding elements are also important. Did you know that 94% of consumers will trust or reject your website based on the website design? If a visitor lands on your page and it’s slow to load, hard to navigate, unattractive, or confusing, they will be inclined to leave your site within just a few seconds of arriving. When this happens, you’re losing out on opportunities to engage with new leads who might otherwise be a great fit for your brand. Your site design plays a significant role in the way consumers perceive your brand. Your business needs to work on establishing credibility and building trust with prospective customers. And your web design plays an important role in that process. The design of your site and the content you provide helps visitors better understand what your business is about and how you can provide value in their lives. To really get the most out of this important digital marketing tactic, you need to develop an attractive and optimized site. Make sure that your site is user-friendly and easy to navigate. Clearly labeled navigational menus and internal links make it easy for visitors to find what they’re looking for. It’s also important for businesses to make sure that their site is mobile responsive. More than half of all internet activity is taking place on mobile devices. If you want to be able to reach this growing market, you’ll need to make sure that your site design is responsive and able to adapt to different device screens. This includes smartphones, tablets, and desktops. Mobile responsive site design is becoming a must for businesses that want to remain competitive in the modern marketplace. In addition to building a fully optimized website, you’ll also want to closely monitor your website metrics over time. Tracking site metrics will allow you to identify lead sources and determine which pieces of content are most popular within your target audience. With this information, you can work to make data-driven changes to your site to bring in more qualified leads and boost conversions. For more information about website design and how it can transform your digital marketing strategy, check out our Website Design Services. Search engine optimization, or SEO, is another one of the most important types of digital marketing for your business. SEO is the process of optimizing your online content to bring in more organic traffic from search engines like Google. This process typically involves emphasizing certain keywords or phrases within your content that closely align with what a consumer might type in the search engine bar. SEO isn’t only about improving the quantity of organic search traffic you bring back to your site. It’s also about improving the quality of that traffic. By publishing content about topics that your target audience finds most valuable, your business is able to connect with the right prospects who are more likely to be interested in your brand. If you want to engage these consumers, you need to work on building SEO. According to HubSpot, 61% of marketers report that improving SEO and improving their organic reach is their top priority when it comes to all types of digital marketing. This should come as no surprise given that 81% of shoppers conduct online research through a search engine before making a purchase. If you want to reach people online, you need to make SEO a priority. Search engine optimization doesn’t just help you reach those who are browsing from their computers. It is also an integral part of reaching your mobile audience as well. In fact, more Google searches take place on mobile devices than on computers in the U.S. SEO is vital for any business that wants to take advantage of the opportunity to boost organic search traffic from mobile devices. If you want to improve your SEO search rankings, you need to start boosting your content marketing efforts. Content plays a vital role in helping you increase visibility in the search engines. In fact, a survey from MarketingProfs shows that 72% of marketers say that content creation is the single most effective tactic for improving search engine optimization. If you want to ensure that your content is optimized for Google, you’ll need to do some keyword research. Keyword research helps you discover what consumers are typing in the search engine when they look for businesses like yours. By developing content around these keywords, you can help improve visibility on the search engines. But it’s important to note that keyword usage is not the only thing that Google takes into consideration when determining your ranking on the search engine results page. Factors like your site design, domain authority, and link building also play a role in your ranking. In an effort to continue to improve the search experience for its users, Google actually changes its search engine algorithm between 500 to 600 times each year. That’s why it’s important to keep up with the latest in search engine optimization and make periodic updates to your various types of digital marketing regarding site and content for best results. SEO is an ongoing process that you’ll need to focus on if you want to continue to drive more qualified leads to your site. Want to learn more about SEO? Take a look at our Search Engine Optimization Services pages to learn more about how SEO can make or break your business. This year, the number of worldwide social media users is expected to reach 2.5 billion people. This means that small businesses that are not on social media may be missing out on an important opportunity to reach and engage new leads on one of the most popular types of digital marketing. Social media management entails a number of different activities. In addition to creating a strategy with your target audience in mind, you will also be creating and posting content across social channels. Social media management often also involves advertising on different channels as well as measuring success based on your defined goals. There are a number of reasons why social media marketing is a must for small businesses. For one, social media provides a space for you to show a more human side of your brand. By posting fun content and spirited updates, you are better able to connect with your leads and customers in an authentic way. Are you missing out on the opportunity to engage such a large audience? Social media channels can also help you drive more traffic back to your site. Whether you’re sharing branded content or posting links to your promotions, there are many opportunities to get users to visit your site. Not to mention, social media can help you improve brand recognition, which becomes important when consumers encounter your site on the search engines or see your ad for a relevant product or service. Yet another reason why social media is important for small business is that it’s cost effective. There are opportunities to advertise on social channels like Facebook and Instagram (more on that later). However, you can still see real results through organic content that doesn’t cost a cent to post. One of the ways that you can use social media management for your business is to reach more leads and nurture the relationships that you’ve already developed with customers. The key to getting the most out of your social media management is strategically choosing your channels. Your small business can’t be everywhere at once when it comes to social media. However, you can make time to be active on the channels that your customers and prospects frequent. Not sure which social media platforms are going to help you get the best results? Be sure to read our guide on how to choose the best social media platforms for your business. Each social media platform provides different advantages for your business. Once you’ve decided which social channels are right for you, you should create a social media calendar to help ensure that you remain consistent when posting content. In addition to posting information about your company and upcoming promotions, you should also share content that you’ve published on your site or blog. Your business should also focus on using social media to engage customers and leads. Respond to comments or questions left on your page or in your social inbox. You can also try starting a conversation online by posing a question to your audience or joining in on a post thread that pertains to your industry. If you’re still trying to wrap your mind around social media management and how it can impact your bottom line, you’re not alone. Check out our Social Media Marketing Services page for more information about why social media management is important for your business. Did you know that over 100 billion emails are sent and received each day? Though email may not be a new communication tactic, it remains one of the most important types of digital marketing for small business to reach their target audience. Email marketing is the process of sending targeted messages to your contacts through email. Like other types of digital marketing strategies, the messages that you send through email marketing are not always promotional. Though email is a good place to deliver information about coupons, sales, and other promotions, it can also be a powerful channel for engaging with your audience through unique and valuable content. With so many other types of digital marketing tactics at your disposal, you may be wondering why email marketing is important. For one, consumers like email because it’s convenient and personal. In fact, 72% of consumers from one Marketing Sherpa survey reported that they prefer to receive brand communications through email versus other channels. Email marketing also integrates well with other types of digital marketing tactics. For instance, you can use email marketing as a promotional channel for the content you create. You can also use email to drive more traffic to your website and your social media channels. This makes email marketing very versatile and effective at helping boost other tactics. These stats show just how important email marketing can be for your small business. Looking at email marketing ROI reveals another important benefit of this digital marketing tactic. Email marketing not only helps drive more traffic to your site and boost sales, but it’s also very affordable. The average ROI for email marketing is about $44 for every dollar spent, which is an attractive return on investment for small businesses working with limited marketing budgets. The first step in effectively using email marketing for your business is to build your email marketing contact list. In today’s marketplace, you need to get consumers to opt into your email messages. You can do this by providing an incentive for subscribing to your email list. One of the best incentives is promotional information that will help consumers save money. However, providing them with valuable content about topics they care about can also drive more sign ups. If you want to get the most out of your email marketing, you’ll need to segment your contact list once you’ve built it up. Email list segmentation involves breaking your contact list into groups of similar subscribers. You can segment based on a number of different factors such as geography, buying behavior, or interests. Once you segment your list, you’ll be able to deliver more targeted messaging to your subscribers. Another way that you can use email marketing for your small business is by setting up nurturing campaigns. Email nurturing campaigns help you nurture or further the relationships that you’ve established with your leads and customers. By consistently communicating with your subscribers and continuing to provide them with content that pushes them further down the marketing funnel, you can work to influence more conversions. You may even speed up your sales cycle! Still not sure how you might best use email marketing for your business? Stop by ourEmail Marketing Services page for more information about how you can speed up your sales cycle with effective email marketing campaigns. Advertising isn’t just for newspapers, magazines, and billboards! In fact, there are a number of social media channels that provide advertising opportunities for businesses that want to boost visibility and expand their reach online. Social media ads come in many different formats, which are dependent on the channel that you are advertising on. The best social media platforms to advertise on will ultimately depend on who your target audience is and what platforms they are most active on. Since social media channels are trying to create the best experience for users, they often hide business content from user’s feeds. Because of this, organic reach on social media channels continues to decline for business. If you want to be able to reach your leads and customers on social media, you will need to supplement your organic posts and content on social with paid ads. This is the only way to ensure that your brand is visible to those who are interested in the types of products and services that your brand provides. The cost to advertise on social media is also relatively affordable when you take a look at the return on investment that you can stand to achieve. Whereas bidding for popular keywords on Google or placing ads in publications can become quite costly, advertising on social media channels is often more affordable. For example, you can reach about 1,000 people on Facebook or Instagram for just $5. As you can see from the graph above, social media ads are much more affordable than traditional advertising channels. One of the best ways to use social media adds to boost your bottom line is byemploying Facebook advertising. The Facebook ad platform has sophisticated targeting features that enable your business to reach the users who are most likely to be interested in your products or services. On Facebook, you can target users based on a number of different attributes. In addition to demographic information, you can also target users based on their interests and behaviors. Facebook also offers retargeting ads that allow you to reach back out to visitors who have left your site without making a purchase. But Facebook isn’t the only social channel that you can advertise on. Instagram, Twitter, and Pinterest also provide advertising options that help you reach new leads across these channels. These can be a great compliment to the posts and content you create for organic reach. Want to use social ads to grow your following and boost conversions? Find out more about social media advertising and how it can help your business by checking out ourSocial Media Advertising Services. Social media platforms aren’t the only place that you can advertise online. Google ads are another one of the types of digital marketing that can be a true asset to small businesses. These types of ads are structured in a PPC model, which means that you pay for each click that you get on an ad. Google PPC ads are one of the best ways to improve your reach on the search engine. Google ads appear at the top of the Google search engine results page (SERP) when a user types the keywords or phrases you’ve bid on. When done correctly, these ads can an excellent digital marketing tactic to supplement your organic SEO efforts. Google AdWords can be a powerful marketing tool for your small business. We’ve already talked about the importance of boosting your visibility on Google. The majority of your customers are using Google to find information about products and services just like yours. If you want to reach these consumers, you’ll need to do more than just work on improving your organic search traffic. This is where Google ads come in. There are many benefits of PPC advertising on Google. Though your organic SEO efforts can take a while to show real results, Google PPC ads help drive immediate traffic to your page. This provides your business with immediate gratification. Google PPC ads also help improve the quality of the traffic that you drive back to your site. When you implement Google ads, you are bidding on the keywords that search engine users are typing in to find products and services like yours. This means that those who are clicking on your ads are most likely looking to buy from a business like yours. Consumers who click on your Google ads are more likely to make a purchase, and when they do, they often spend more. The best way to use Google ads for your business is as a supplement to your organic SEO efforts. Instead of waiting for the organic traffic to come in over time, you can start seeing results now by using PPC ads in addition to content marketing and other SEO-building tactics. To get the most out of your Google ads, you should measure your Google advertising results over time. Google AdWords allows you to easily track with ads, ad placements, or keywords are driving the most return for your business. After doing this, you can work to adjust your Google ad strategy to maximize your results and optimize your online ad spend. PPC management can be quite complex, and if you want to get the most for your ad spend, you need to know just the right tactics for increasing traffic and conversions. Learn more about managing Google PPC ads by visiting our PPC Management Services page. Now that you know all about the different types of digital marketing tactics and how each can benefit your business, you’ll be able to make smarter decisions about what channels you use. Being more strategic about your digital marketing strategy enables you to maximize your campaign results while optimizing your budget. When it comes to digital marketing, you don’t have to go it alone. If you need some help getting started with your strategy or implementing effective campaigns, the digital marketing experts at LYFE Marketing are here to help. If you still have questions about which types of digital marketing might be right for you, don’t hesitate to contact us today.